The Video Timer tool allows you to see the current time in a video. The zero point can be changed to suit your needs. Displays the current time in seconds based on the Zero point. Use this button to set the Zero Point. An example would be a golf swing: Move the video to the top of the backswing and click to set the Zero Point. 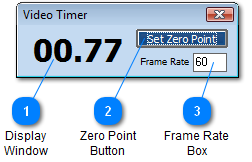 The Display Window (item 1) will now show a negative number when showing frames before the top of the backswing, and a positive number when showing frames after the top of the backswing. When you open the Video Timer, it is filled with the frame rate of the video. This number is not correct with some videos that are shot in slow motion. If your video was shot in slow motion, put the frame rate for the video (120,240 etc) in this box to update the timer.